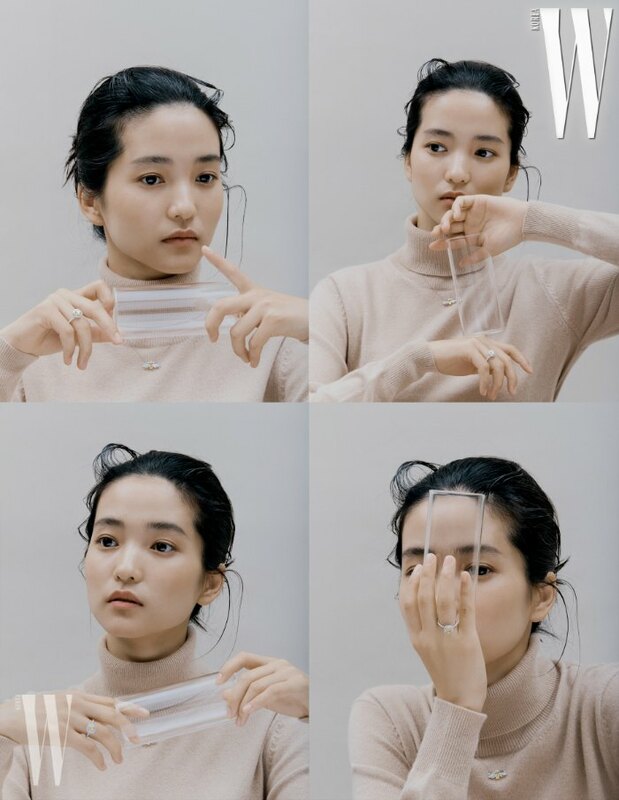 Kim Tae-ri (김태리), fresh off her hit Mr. Sunshine, has blessed us with a W Korea spread complete with four different ways to hold a glass cup. I have spent the better part of 30 hours watching her in Mr. Sunshine and, though Mr. Sunshine is not my jam, I can’t really say anything disparaging about her, the cast, the cinematography, set design, costumes, or the overall storyline. Everything is done to an exceptional degree. They are inconsistent on some historical things, but I will let that pass because I am not an expert myself. Editing is probably the one aspect of Mr. Sunshine that could have been kicked up a notch by cutting out a lot of middling scenes and long desperate stares. Though that would cut out most of Kim Tae-ri (and everyone else’s) part in that drama, so there’s that. But Kim Tae-ri’s overall performance (ie. the longing stares, pensive stares, high dudgeon stares, bougie stares, forlorn stares, woebegone stares, and occasionally delighted stares) was thoroughly convincing to me. I never bought the love story with her and Eugene, but I wasn’t irritated by it either. Kind of like when your friend likes someone and you cannot for the life of you understand why or really wrap your head around it at all but accept that they are together….it’s like that. 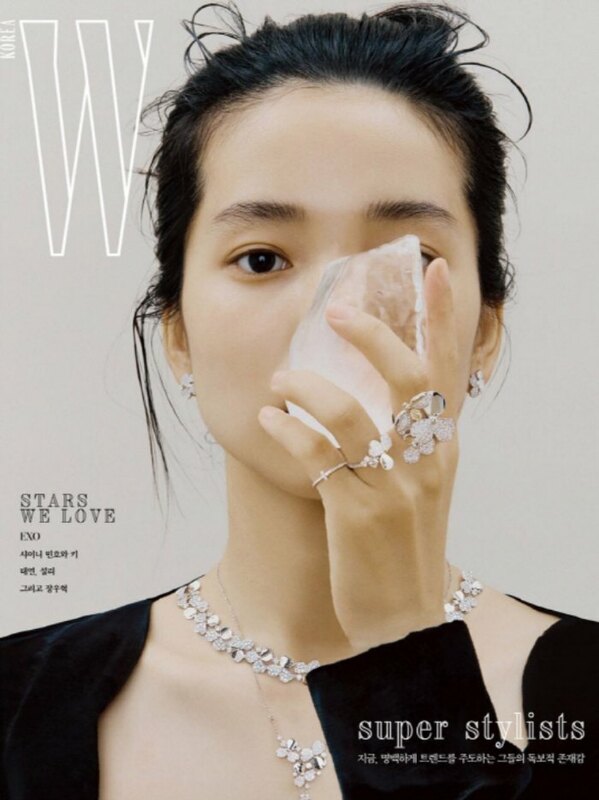 This W Korea interview is more of an opinion and observation piece by the writer, Kwon Eung-kyung, that has the potential to really mess up the perception of the interviewee if the writer does not like the subject (i.e. actor, model, musician, artist, etc) they are covering. That is not the case here as Kim Tae-ri is given more of a mystical appearance if anything. For instance, there is a lot of flowery language describing gestures and guessing at what Kim Tae-ri might be feeling instead of a direct question and answer. I think that might just be W’s style though. They are more of a storytelling magazine that can be lovely if you want to be swept away into the magic of words so long as the words make sense. Unfortunately, we had to sift through all the smoke to make any sense out of this interview. But I will give you a bit of a taste of what is going on. The accompanying photos, by the way, are gorgeous. They are mostly beauty shots because they care nothing about anything but her face. I can not blame them because she does have an interesting and cute noggin. She is also dripping in delicate and clean diamonds which are best showcased with her delicate and clean features. I especially like the shots that have bubbles in them. Who would have thought a cheap child’s play thing, created to be happily watched and delightfully destroyed, could pare so well with the most expensive and indestructible rock on earth. I have never thought about popping bubbles with diamonds, but now I want to. All photos are showcasing Tiffany & Co. jewelry from their Paper flower diamond collection. The brown knit top is by Low Classic. The beige cashmere turtleneck top is by Jain Song. The linen suit and silk blouse are by Jaybaek Couture. And the light grey turtleneck knit is by Vince.